You should be redirected automatically in a few moments, but if not, please click here to see if A hidden West Derby path has made the transition. Liverpool is (like so many other places) full of the remains of hidden paths and landscape clues. 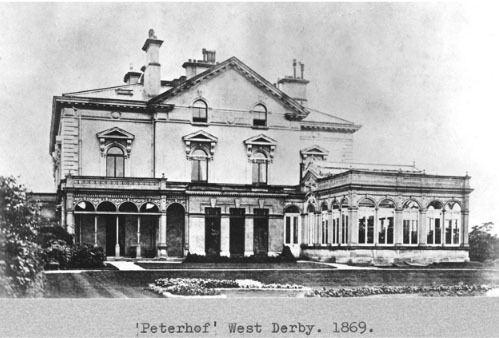 This week I’m looking at one in West Derby, once the home of ambassadors and merchants. I was reminded of a certain footpath by a short video posted in the Facebook group West Derby Society back in 2014. This group has links with the excellent West Derby Society, based on Lowlands on Hayman’s Green in West Derby Village. The Society seems interested in all things West Derby, but this naturally involves a heavy emphasis on history (and its preservation). All to the better! The video is of Blessig’s Style, a footpath running from Leyfield Road to Blackmoor Drive. Now blocked by a gate, it was originally part of a right of way which went all the way from Low Hill to Knowsley. It survived as an accessible route well into the 20th century, and anyone who lived in the area up to 1965 will remember being able to use it to cut between the back gardens of the houses either side. Before the path was blocked by magistrates it ran unbroken from where the film was taken (Leyfield Road), straight across Blackmoor Drive and up to Eaton Road. It’s interesting to see also that it lines up with Thornhead Lane (heading towards Sefton Rugby Club) at one end and Central Drive (part of Sandfield Park) at the other. And as you might be able to predict, a look at the old maps shows that it can be traced to a great extent to the north east. 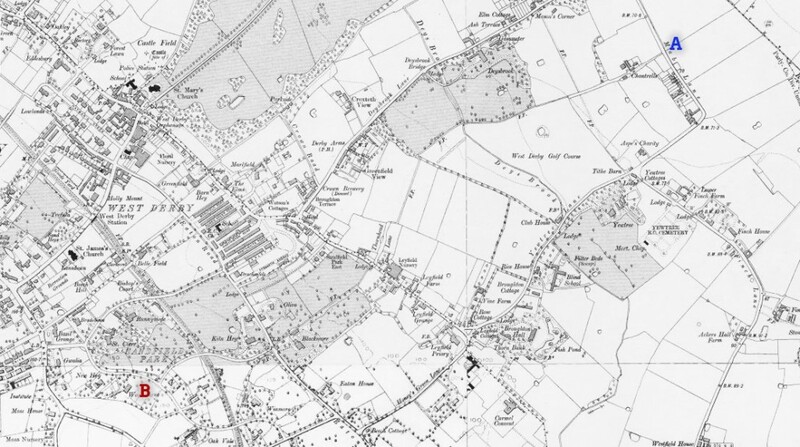 The route to the south west is not so clear on the Victorian maps, but this is partly due to the disruption of the railway line cutting across it, as well as Liverpool’s own expansion. Of course, what us intrepid archaeological landscape explorers want to see are the clues on the ground! Well, you can still see evidence (beyond the gated route) amongst the 1930s housing of today. For a start, it’s no coincidence that a house much older than the surrounding ones occupies the plot immediately to the left of the path as you look from Leyfield Road. 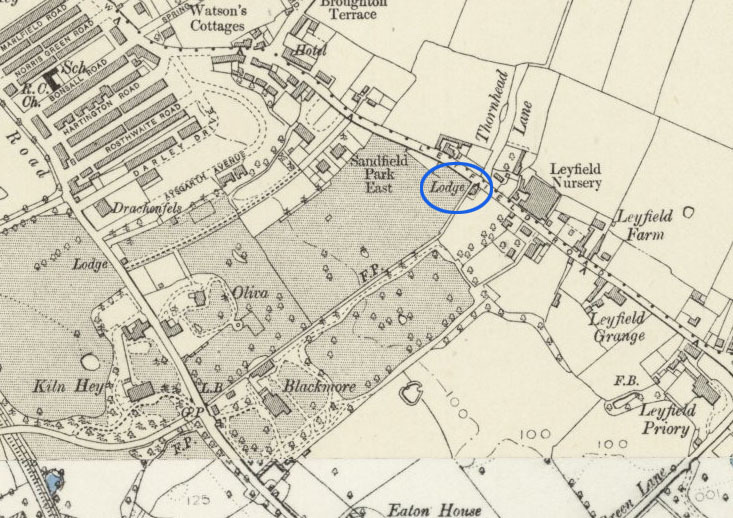 This is clearly marked on the map above as ‘Lodge’ (see extract below) and guarded the entrance to the Blackmoor Estate from the north. It may even have been where deliveries and tradesmen would have entered the grounds of the house. Moving to Blackmoor Drive and Eaton Road, all the places where the footpath once carved its route through the fields have been fossilised as larger gaps between the houses. Indeed, one house on Blackmoor Drive may have been designed differently to its neighbours purely to adapt to the unusual plot, though this is not certain. The wider gaps have now all been filled in, either with house extensions or walls. The gardens which back onto the former path have probably all been extended to cover the extra space. Finally, on those wider gaps, you can also see an old sandstone wall which pre-dates the suburb itself. The video shows this wall on the left hand side, and if you stand on Eaton Road today you can see the self same wall (tragically half whitewashed) emerging from between the third and fourth houses. Blessig’s Style takes its name from P.J. Blessig, a Russian-born merchant who came to Liverpool at the tender age of 24 in 1845. He initially rented a house on Marine Crescent, Waterloo, and gradually increased his wealth in partnership with one Francis Caesar Braun (who eventually bought Holly Lodge as a residence) until he was able to build his own house in West Derby in 1863. He named this huge residence ‘Peterhof’ after the Tsar’s summer residence on the Gulf of Finland(!). The house was later renamed ‘Blackmoor’ (after the original name of the local area) by its next resident, Rankin Heap, a member of the Heap rice miller family of Heap’s Rice Mill fame. Blackmoor was demolished in 1925 in order to build the houses which now cover the area (including my own childhood home!). Well, I hope you’ve enjoyed this little jaunt through the secrets embedded in the landscape of West Derby. Local road names like Blackmoor, Eaton and Leyfield all have their origins in buildings around here, so it’s good to be reminded of this by the likes of Blessig’s Style. Blessig was a Russian consul at one point in his career, but I wonder if even he would have predicted that his name would live on for centuries in the minds of the local people! 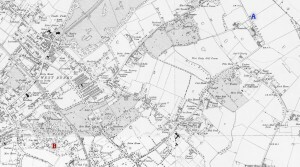 Ordnance Survey map of Lancashire CVI.NE, Revised: 1906, Published: 1909. National Library of Scotland. Accessed 28th October 2015. Today, 28th October 2015, is the 8th birthday of the Liverpool Landscapes blog! It started in 2007 as a little summary of interesting news and snippets, but has grown to encompass much more than that. Here’s to many more years of exploring the historic landscapes of Liverpool!